All outer parts are made of titanium. Also a thin layer of silicon dioxide on the lens body was added to keep unwanted prints from fingertips away. All lenses have the same unique limited number as the camera. The first set for example has number 1954/28 on the 28mm Summicron-M lens. Other lens numbers for that set are 1954/50 and 1954/90. Where the Leica 28mm f2 Summicron-M lens comes with an external titanium hood the other 2 lenses have built in lens hoods. All 3 lenses have solid titanium front lens caps. A very nice Rimowa case comes with the set. 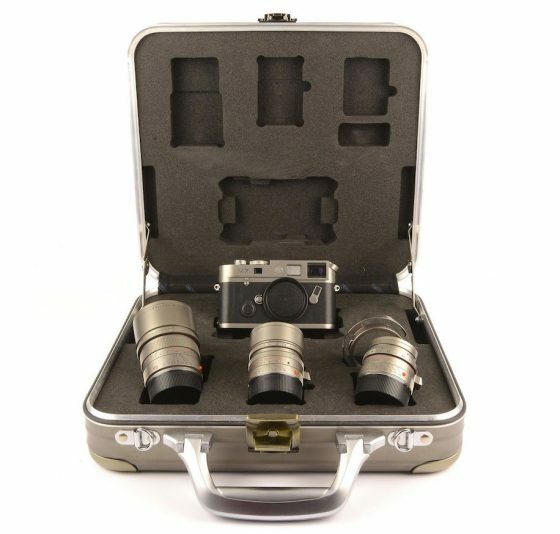 The case, made from aluminum but painted with titanium color, allows the titanium body and lenses to lie comfortably inside. Extremely rare set. If you were ever looking for a set like this this is your chance. Set is in mint condition with no mentionable signs of use. Lens elements are clean. This entry was posted in Leica Auction Madness and tagged Leica Limited Edition, Leica M7. Bookmark the permalink. Trackbacks are closed, but you can post a comment.